The world watched on May 19, 2018 as the lovely Meghan Markle married her dashing Prince Harry, who was pristinely dressed in a frock coat uniform of the Blues and Royals. To commemorate this significant occasion, The Ashton-Drake Galleries has commissioned the world's finest artisans to capture the royal bridegroom in stunning bisque porcelain with the exclusive Prince Harry, Royal Romance Groom Doll. 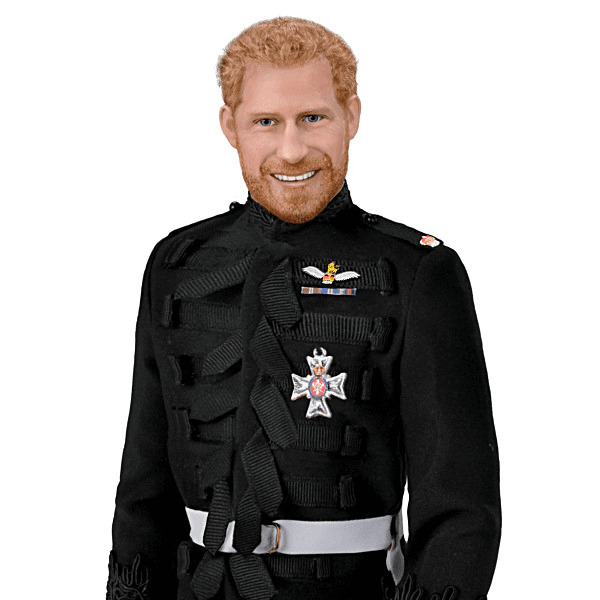 With an expression that perfectly reflects his pure joy on the day he and Meghan exchanged their vows, this Collector's Edition doll is an unforgettable way to relive a royal celebration that will go down in history! 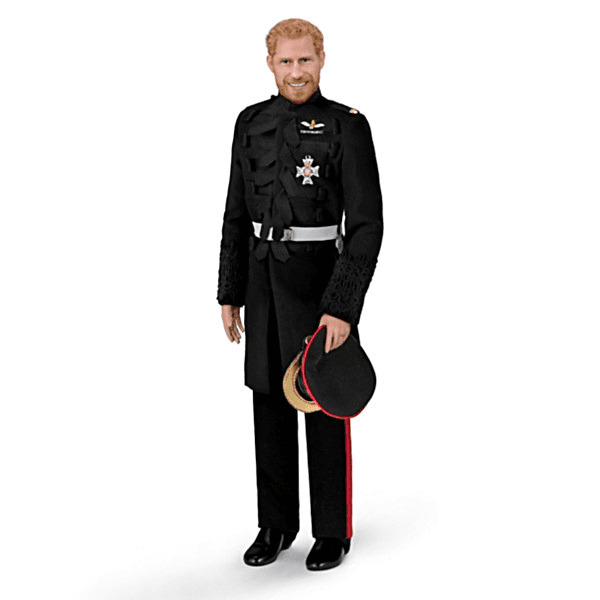 Handcrafted of fine porcelain for exquisite realism and standing at an impressive 17-inches high, this Prince Harry collector doll is poseable and meticulously hand-painted to enhance his handsome good looks. Inspired by his wedding day ensemble, his black twill coat features black cording on the stand collar and sleeve cuffs, and his military medals and regalia are proudly showcased on his left side. His black slacks with wide red striping, white faux-leather belt and military cap add drama and authenticity to the ensemble. It's a must-have Royal Family collectible tribute, and is the perfect match to the Meghan, Royal Romance Bride Doll! Fine adult collectible, not intended for children under 14.